"This is a nice change from ordinary quiche. 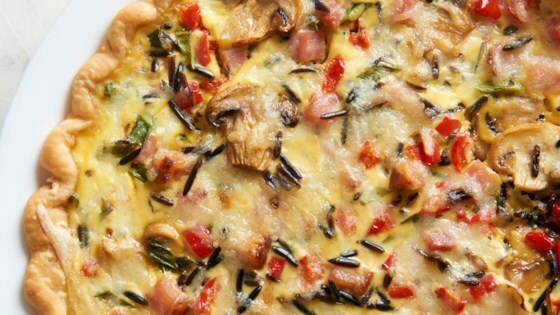 Full of ham, wild rice, mushrooms, red bell peppers, and flavored with a touch of Dijon mustard, this quiche is fabulous for breakfast, lunch, or dinner. And the meat & veggie mixture is terrific simply scrambled with eggs for a quickie meal!" In a small pot, bring the water and wild rice to a boil. Cover, reduce heat to low, and simmer 45 minutes. Preheat oven to 425 degrees F (220 degrees C). Bake the pie crust 10 minutes, or until golden brown. Reduce heat to 400 degrees F (200 degrees C). In a bowl, mix the cooked rice, ham, red bell pepper, green onion tops, and mushrooms. In a separate bowl, mix the eggs, sour cream, mustard, salt, and pepper. Sprinkle the bottom of the pie crust with 1 cup Swiss cheese. Spread the rice, ham, and vegetable mixture over the cheese, and cover with the egg mixture. Top with remaining Swiss cheese. Bake 30 minutes in the preheated oven, or until a knife inserted in the center comes out clean. Let stand 10 minutes before serving. This is a fabulous recipe!I did not have any swiss and used cheddar instead and it was still wonderful. I liked the sour cream as an alternative filler but I did not care for the rice in the quiche. My husband ate it but agreed. WOW!!!! Great recipie. I loved the wild rice in it, so delicious. I made it for the first time 6 monts ago and its been a monthly request since. Thanks. Marvelous!!! Wonderfu! Response: from 7 ladies asked for recipe and 1 doesn't cook! Will serve for lunch or breakfast. thank you, Sue S.